Mine: Wonderfully complex plot. Great performances all around. It doesn't get any better than this. 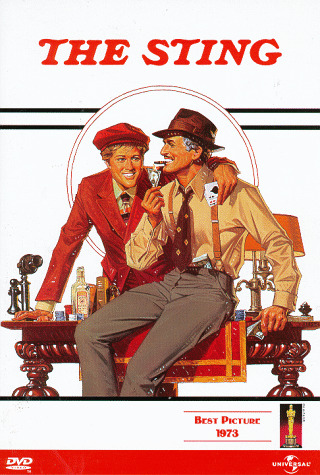 Leonard Maltin/Plot synopsis: Two small-time Chicago con-men try to put "the sting" on a high-roller from N. Y. C. (Shaw) after he has one of their pals killed. This long but entertaining film won seven Oscars, including Best Picture, Director, and Screenplay (David S. Ward), and sparked national revival of Scott Joplin`s ragtime music (arranged here by Oscar-winner Marvin Hamlisch). Sequel: THE STING II. (out of 5 stars) I really loved this movie. This movie had a GREAT plot, and the acting by paul newman and rob red were awesome. Very fun, interesting kind of movie. you have to pay attention or youll get lost and wontk now whats happening, but if u do, ur in for a really good time.